Cybercrime is one of the largest concerns impacting the world today. The increased sophistication of cyber attacks and lack of implemented security programs has led to some of the biggest data breaches in history. According to a recent study by Cybersecurity Ventures, approximately $6 trillion will be spent on cybersecurity globally by 2021. As more organizations make the fundamental change in their cybersecurity strategy, it’s crucial to get a better understanding of the current landscape of threats impacting businesses around the world. 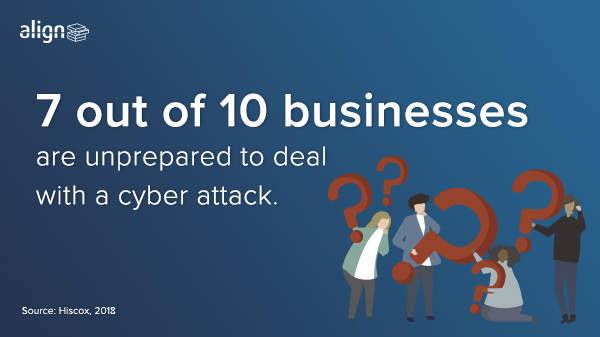 According to a 2018 Cyber Readiness Report by Hiscox, 73% of businesses fell into the novice category when being ranked according to their current security plan. The model surveyed 4,100+ executives, departmental heads, IT managers and professionals from different organizations. Only 11% of the respondents were categorized having expert-level strategies. For companies to build a strong cybersecurity program custom for their business, they must take an integrated and holistic approach to determine the best strategy for their business. This allows businesses to examine all the resources they have and determine where they need help. 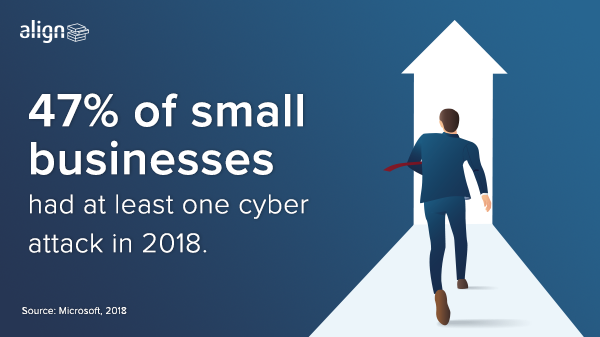 Of those small businesses attacked at least once, 44% of them also experienced two or more attacks. Smaller companies tend to be more vulnerable because they don’t have any formal strategies set in place. With 50% of small businesses stating that lack of budget has challenged them to take action on cybersecurity measures, it’s time for them to rethink and prioritize how to protect themselves. Ensuring that small business owners create a cyber awareness training program for employees and teach them to spot different social engineering tactics will help defend them from potential cyber threats. This research was reported in the Ponemon Institute’s 2018 Cost of Data Breach Study based on 500+ companies affected by a data breach in the past year. The cost outlined a series of factors including the loss of business and reputation, costs of technical investigations and recovery, legal and regulatory activities, notifications and more. Based on the previous year, the average cost of a breach saw a 6.4% increase. As the average cost of data breaches continues to rise, having additional tools and resources like an incident response team, threat notifications and vulnerability assessments can help save money on the total cost of a breach. That’s five months for hackers to hang around, find various system vulnerabilities and steal sensitive information, all while hacked into your network! As reported by Microsoft, traditional IT security tools have limited protection against sophisticated cyber attacks when credentials are stolen. This makes it easier for hackers to get into your network and plot their attack when the time is right. 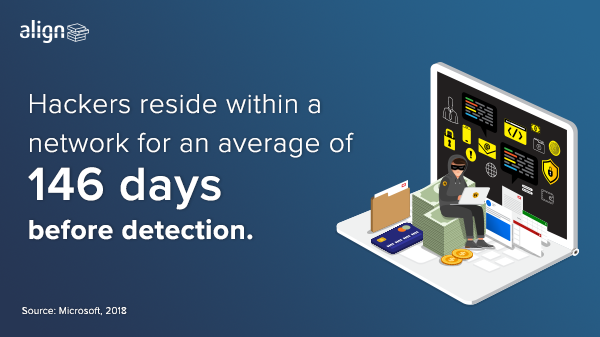 Having a managed threat protection program will allow your company to have their systems and data continuously monitored 24x7x365 so that they can hunt, detect and respond to threats at all times. 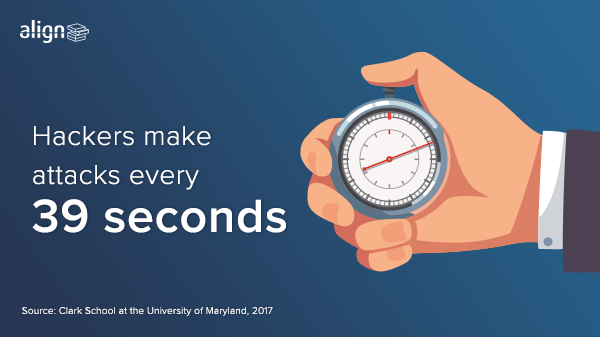 According to the 2017 Clark School study at the University of Maryland, computers get attacked an average of 2,244 times a day. The study found that hackers were able to get into computers using basic “dictionary scripts” that allowed them to run through a list of common usernames and passwords. In order to avoid hackers gaining easy access to your computer, avoid using generic usernames and passwords. Always generate complex passwords with a mixture of letters, numbers, and characters. No matter how much the threat landscape has evolved over the years, malicious emails still remain as the leading cause of most cyber threats. 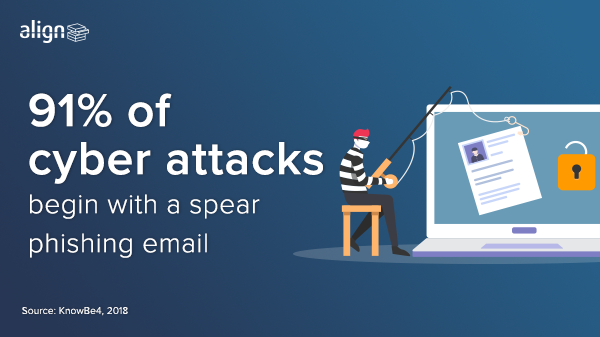 Spear phishing involves email attacks personalized to the victim, by addressing their name or title and deceiving them to open a malicious attachment or link to malware. How can you spot a phishing email? It’s helpful to familiarize yourself with the various types of phishing techniques and take mock cybersecurity exams so that your entire organization can remedy areas where they lack the right expertise. Evolving technology brings evolving hackers, and the current risk landscape has a deep need for companies to hire on more cybersecurity professionals and services to keep up with the changes.